most healthiest cooking oil, lubricate your food with a soothing taste. Most Healthiest Cooking Oil, Food With A Bang! The most healthiest cooking oil base on my study is coconut oil. Coconut oil is extracted from the meat of matured coconut gathered from the coconut palm. It is very slow to oxidize and it’s also resistant to decomposing. But what makes it the healthiest cooking oil? Over the years people have been using different type oils to cook with like vegetable oil, olive oil, sun flower oil, safflower oil, and canola oil but never understood the pros and cons when applied during cooking or after cooking. Now with that said let me take you into my study to show you why coconut oil to me is the most go to oil to cook with. This causes it to change properties and damage the oil from its purities which creates free radicals. Therefore instead of promoting health, it can actually promote disease in the body. Nevertheless these fatty acids/oils are very good for the body in their raw state when use on salads and food after it’s cooked; therefore they have their place. 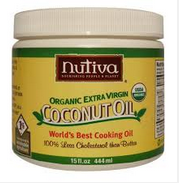 NOTE: The best type of coconut oil to use is the "pure unrefined cold press organic extra virgin coconut oil". Now let’s see why I concluded that coconut oil is the most healthiest oil to cook with. Although coconut oil is high in saturated fat and you might have heard that saturated fat cause high cholesterol; in this case, not coconut oil because it carries the good form of saturated fat which is comprise of medium chain triglycerides that promotes weight loss. Furthermore when you consider cooking or frying it, it does not get damage or oxidize quickly because of its saturated fatty content. In addition it can last up to two years and it also gives your food a wonderful flavor. You can also apply coconut oil to your skin and hair. It helps moisturize the scalp and dry skin as an added benefit. does that not make coconut oil the most healthiest cooking oil to use?